Whenever we talk about Garage 51, it will remind me of their Nutella menu that caught everyone attention. You won't feel boring with their menu as Garage 51 always surprise you with something new. This round Garage 51 collaborate with Mister Potato to introduce a special menu. The menu looks attractive and unique as it filled with lovely purple color. Take a look back for their famous beverage from the Messed Up Family , The Son . Oh my, this is my favorite milkshake and it contains Nutella with hints of hazelnut. Topping up with chewy Marshmallow. A perfect combination that give a kicks to your taste bud. Don't ever...ever forget to place your order for Mochatella. Fill up your life with the sweetness of the Mochatella. A perfect match when pouring a fresh milk on the coffee ice cube that has mixed with Nutella. Take a sip of it and enjoy the wonderful moment. 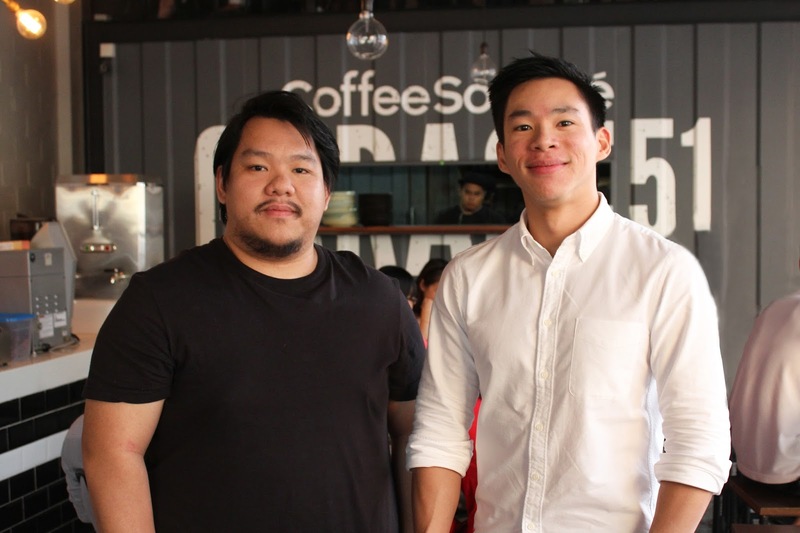 The smart duo brothers of Choong Kar Wai and Chong Kar Heng, founder of Garage 51, brings more happiness to food lover like me. After the success story of their Nutella menu, they are back with unique propositioning with Mister Potato. I believe everyone love Mister Potato. Inject in the Nutella on the pancake and it fills up every layer of the pancake. You will definitely love it after take a big bite on the pancake that fill with vanilla ice- cream and Nutella. Introduce to you Garage x Mister Potato Pancake With Nutella (RM18) Don't stop at there as you can top on with this crispy potato chips. Feel the softness of the pancake and at the same time the crunchiness of the potato chips. If you crazy about burger, you should give a try on their Smoked Duck Burger With Mister Potato Sweet Potato Crisps (RM26). The portion is generous and I enjoy eating it. The smoked duck is juicy. The burger filled up with cheesy on the top of it and love every bite of the burger. And sweet potato crisps add in the perfect balance. Enjoy the crispiness of Mister Potato Sweet Potato Crisps With Tomato Salsa & Garage Dip (RM13) . Dip in the potato chips into the sour cream and add on some tomato salsa. Love it. Looking forward for this coming weekend as I can't wait to try the rest of the menu. Garage 51 and Mister Potato collaboration menu is available at Garage 51 cafe from 1st March 2017 onwards and price is range from RM17 to RM26. Follow them on Facebook at https://www.facebook.com/Garage51MY for more promotions.